Preheat oven to 350ºF. Line a 12-cup cupcake pan with cupcake liners. In a medium bowl, whisk together the flour, baking powder and salt. In a separate small bowl, whisk together the buttermilk and vanilla extract. In the bowl of a stand mixer fitted with the paddle attachment, cream the butter and sugar until smooth and fluffy. Add in the mashed bananas and beat for another minute. Add in the eggs one at a time, beating between each addition, and continue to mix until smooth, about 2 more minutes. With the motor running on low speed, add in half of the flour mixture, then the buttermilk mixture, and finally the remaining flour. Mix until just combined. 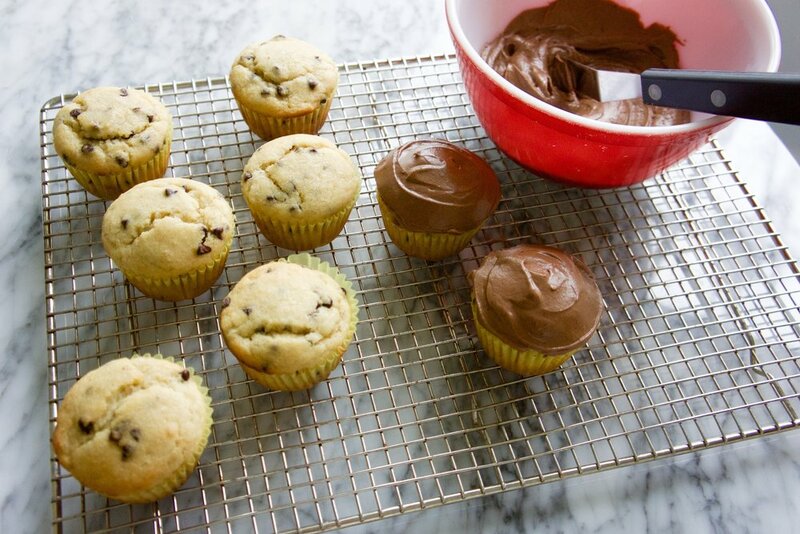 Stir in mini chocolate chips with a rubber spatula or wooden spoon and divide the batter among the lined cupcake tin. Bake for 15-18 minutes or until a toothpick inserted in the center comes out clean. Transfer pan to a wire rack and allow cupcakes to cool completely before frosting them. In a small bowl, whisk the cocoa powder into the hot melted butter until chocolate is completely smooth. Pour into the bowl of a stand mixer fitted with whisk attachment. Add in the warm milk and vanilla and whisk until smooth. Gradually add in the powdered sugar beating between each addition. If frosting is too thin, add more powdered sugar. If it’s too thick, add a little more milk, one teaspoon at a time. 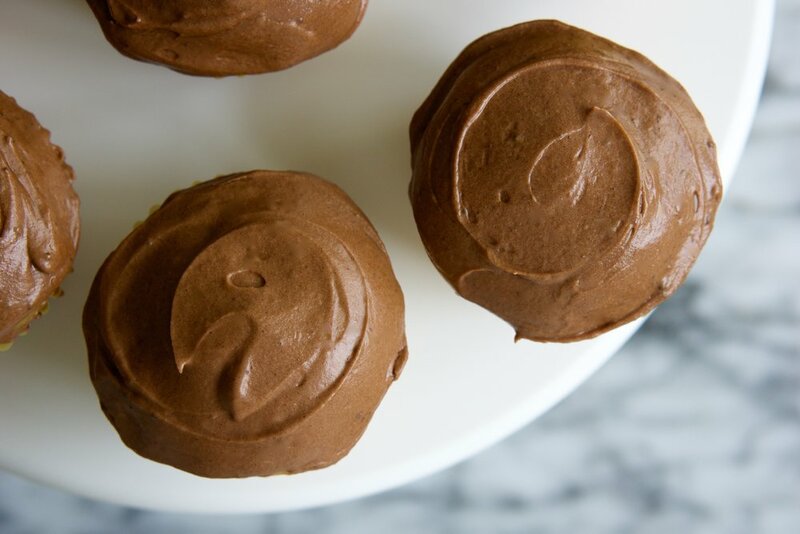 Frosting should be thick, but easy to pipe or spread.